It’s slow going on a Sunday afternoon in the new installation of European Paintings (1250-1800) at the Metropolitan Museum. 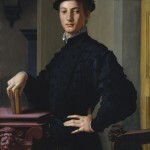 The handsome spaces have been spruced up and galleries once given over to temporary shows now are part of the logical flow of ideas and innovations that can be found in this stunning stretch of time in Western art. Some seven hundred paintings plus sculpture and a judicious sampling of decorative arts do not foster a quick run through for most visitors. I had left Cincinnati on a morning flight and come to the Museum directly after checking in at the hotel, with nothing to do today but this. It was August, New York was in summer mode, a general air of If I Can’t Be in the Hamptons I Might As Well Be Here prevailed. Chronology and geography are the rules of arrangement in the reinstallation, rules cheerfully put aside when another purpose prevails. 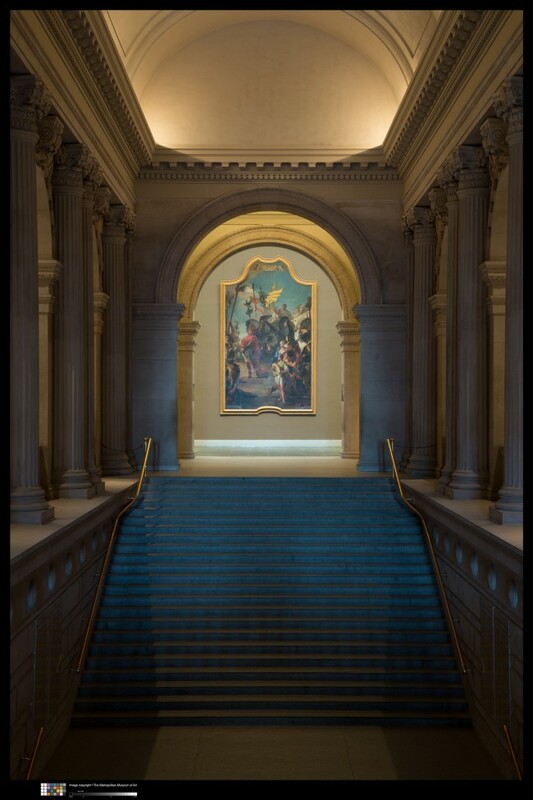 So, the visitor who has toiled up the grand staircase and enters Gallery 600 is bowled over by Tiepolo (1696-1770), late in the day for the established time period but a consummate practitioner of one of its glories: fresco painting. The next forty-four galleries show us, among other things, how we got there. Attention has been given to period frames; judicious cleaning of paintings has taken place where needed. 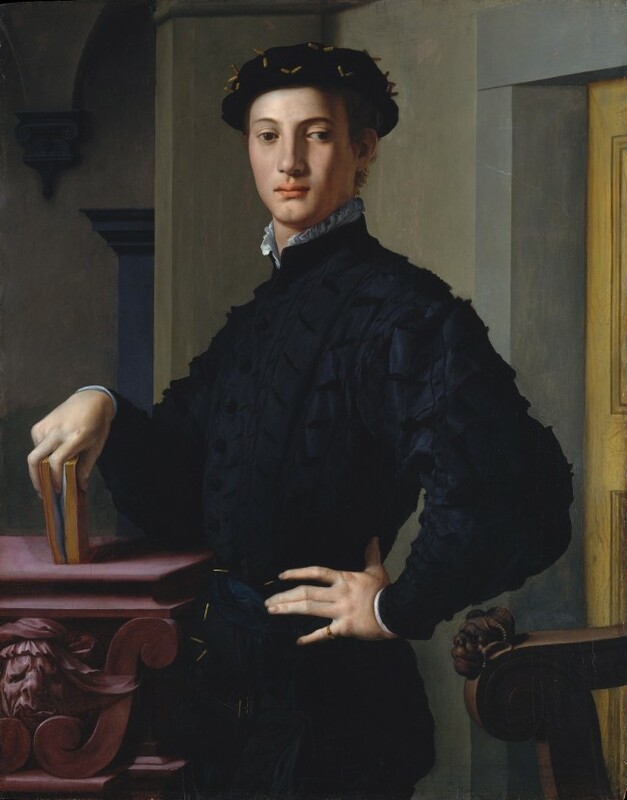 In Gallery 609 Bronzino’s much reproduced portrait of a young man is as striking as ever, but when actually seeing it one notices a cast in the left eye, making him touchingly real. In the same gallery Michelangelo’s unfinished portrait (now established as by Daniele da Volterra) shows only the head and one hand, but you would know that sad face if you were to see it on the street. On to Spain; El Greco swings in and painting changes. Velazquez, faultless works whatever the subject, surely could have painted Philip IV in his sleep. Phillip is represented here, of course. Did Goya keep bread on the table by painting portraits? 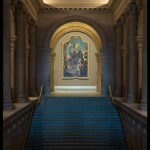 The Goya room is rife with them, some wonderful, but they’re not his most important work. Meanwhile, time has passed, I’ve gotten lunch in the cafeteria, and many galleries remain. I ditch 17th and 18th century France and go straight to northern Europe. The Dutch! So satisfying! They show us that the more things change the more they remain the same. I poke happily about, make a note about a Van Dyke portrait of Robert somebody wearing scarlet jacket and lustrous waistcoat, with pile of armor at one side looking at first glance like a motorcycle at rest. If Robert lived now he would have a motorcycle, I think, one of the show-off kind. And Van Dyke’s own self-portrait is there, his long-fingered hands, his own tools, prominent in the composition. Before I know it it’s 5:30 and we are being hustled out; the cab line fills fast and soon I leave in one. At my pleasant, relatively inexpensive (for New York) hotel wine and cheese are available in the tiny lobby and I join a few women with glasses already in hand. “And where are you from?” I ask, once I have my own. There is something of a chortle; they’re all from Manhattan. Only one is an actual guest in the hotel; her apartment on 22nd street is for some reason uninhabitable at the moment, and the others are her friends. I seem to have chanced into a modest hotel known to locals. They are polite about my being from Cincinnati, which might as well be Kalamazoo or Oshkosh to them, and we finish off our wine together. The Italian restaurant where I had meant to go had a sign on its door: “Closed Sundays in August,” but directly across the street was another Italian restaurant, with a specialty. “Kosher Roma cuisine.” Inside was a long, thin room, banquet seating at the sides, a plentiful scattering of yarmulkes on diners’ heads. Kosher Roma cuisine seems a little heavier than the Italian I’m used to, but was fine. I was ready for bed, in any case. Traversing European painting from 1250 to 1800 is a long way to go, but it’s bedrock for our artistic culture. Of course and luckily other influences elbow in, but all that I had seen today is at bottom. Bedrock was not what had brought me to New York, however. The other end of the scale, where we might be going and if not, what an experience anyway, was the reason I was there. 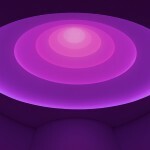 I’d seen one or two of James Turrell’s earlier installations, in London, and found them magical. I had come to New York to go to the Guggenheim where his “Aten Reign” fills the building’s defining central void with what the museum describes as “shifting natural and artificial light and intense, modulating color.” Indeed. 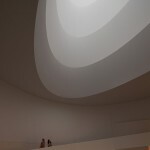 Pads are laid on the floor directly beneath the oculus, the central opening at the top of the building, so that the young and lithe may lie down for the full experience. The sloping, curving walkway that normally outlines this several-storied atrium has been closed off in the course of installing the screens and lights and filters that produce “Aten Reign.” Aten refers to the Egyptian sun god, of course, the first monotheistic religion of record so an innovation itself. Reaching back for its name, the piece reaches forward in its conception to ask for as much time as the viewer cares to give to its continuing permutations and dissolving effects. Those who choose not to lie full length below are accommodated on a curving bench around the edge of the room, its slanting rear designed for leaning back and looking up. The work’s elliptical shape is exaggerated from this vantage; I regret that lying flat on the Guggenheim floor was not an option for me. I’d like to have contrasted the viewpoints. So, what’s going on? 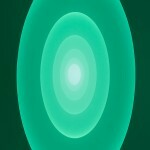 Color, palest in the middle, gradually darkens through the five concentric elliptical spaces, changing all the time. Pinks become lilac, blues move into greens, yellow comes up from somewhere. Meanwhile, perception of shape is altering. The rings appear concave, until suddenly they are convex, and after a time are concave again. It is strangely compelling to watch this, thinking that the egg-shape of the central elliptical form suggests birth and beginnings, that the old testament says light itself was one of God’s earliest inventions. I spent the day there, more time than needed really but that was what I’d come to see and I had the day for it, dropping in to spend a stint of time with Aten whenever I felt like it. Elsewhere in the museum are four examples of Turrell’s early works, white light in black settings, tilting reality already and upsetting expectations on every hand. The Guggenheim has never been an easy museum to find one’s way in; with Aten reigning in the central portion it’s worse yet but I managed to find the cafe for a coffee, went to the elegant Wright dining room for a very nice lunch, and turned up a surprising exhibition of the Thannhauser Collection: French Impressionists, Post-Impressionists, Italian Futurists. The Collection came to the Museum as a gift from its art dealer/collector who saw himself as sharing Solomon Guggenheim’s goals. To my astonishment, the Impressionists looked unfinished: the result of all that pre-1800 art I had looked at the day before. The Collection includes Paris night life and Picasso at play: i.e. two still lifes of the same objects made on two succeeding days. And sometime in the afternoon, as my ticket provided entrance all day, I went across the street and sat in Central Park to watch that world go by. Roberta Smith was qualified about “Aten Reign” in her New York Times review. 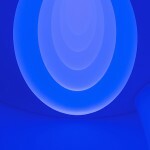 “I like Turrell well enough,” she wrote in damn-with-faint-praise mode, She’s uncertain that the movement he emerges from, “Light and Space,” dating from the late 1960s, is as groundbreaking as it’s sometimes given credit for and implies mildly that the three exhibitions now celebrating the 70-year-old artist (one at Los Angeles County Museum of Art, one at Museum of Fine Arts in Houston, along with the Guggenheim one) are perhaps excessive. She wonders a little about his magnum opus, the extinct volcano in New Mexico he’s been working on for years. 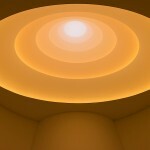 But in spite of herself, she has to say some of Turrell’s work “is breathtakingly beautiful and definitely gives you the heightened sensory experience of seeing yourself see.” Not small things to accomplish. I thought they were worth the trip. 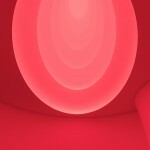 The Turrell shows continue at the Guggenheim through September 25. My plane the next day didn’t leave until five; I had the day to mid-afternoon. What to do with it? The Whitney, where Edward Hopper drawings just now are in a special show, was on my list but closed on Tuesdays. Then – why hadn’t I thought of it before – the Frick. Perfect. I never go to the Frick without thinking of arriving by cab with my husband and our son and seeing the sign that then as now states no visitors under ten. He was eight, and carrying a balloon. But the cab ahead of us discharged a dowager with grandchild, also under ten. She swept in and we were in her wake. There was a bad moment when our son drew attention to himself by checking his balloon – we lived in the country at the time but he was quick to adapt to city ways. The attendant smiled, we stuck with the dowager, all were admitted. He’s been there often as an adult and today will say the Frick is the quintessence of museums, or something to that effect, but has no memory of checking his balloon. Perhaps the Frick is the quintessence of museums. Here it is, this gracious house, with absolutely first class art in every room. There are two Vermeers; with the five at the Metropolitan that made seven sightings in a two-day spread. Can you see that many in the Netherlands? Hung around for a while in the Fragonard room, one glorious painted panel after another, to make up for slighting the French at the Met. But the truth is my heart lies elsewhere, and I sat for quite a long time in the fine West Gallery where nothing can be faulted. Mr. Frick tended to like two of things, where another collector might settle for one. This room is anchored by a large Turner seaside scene, suffused with yellow and centrally hung on the north wall, faced by another large Turner seaside scene, also suffused with yellow, on the south wall. The desire for two is perfectly exemplified in the Oval Gallery just beyond, where the current spare hanging includes four tall Whistler full length portraits, two with dark backgrounds and two with light backgrounds, the dark ones flanking a doorway and the light ones on either side of a grayish sea scene, also by Whistler. There’s a bench in the center of the room, for contemplative purposes. It was usually occupied, when I was there. But I couldn’t stay too long; my plane would leave without me. I asked a staffer where to go for lunch in the neighborhood and was directed to a deli where the faint-hearted might never get their food but those with moxie did fine. Summoned what moxie I could and had an excellent sandwich before the cab, the flight, the return home. An old New York hand told me it takes a day of rest for every day in New York before you feel yourself again. All that New York energy pushing at you leaves its mark. Indeed, after three days I was myself again, but happily still had a head-full of what I’d seen.